Home › Style › Love curry? Eat healthy curries! Eight excellent vegan curries at selected restaurants in Tokyo. Love curry? Eat healthy curries! Eight excellent vegan curries at selected restaurants in Tokyo. If you love curry don’t pass up this report! Out of all of the variety of curries, this report introduces you to “vegan curries” which are very healthy and tasty. Even if you are not a vegetarian, or if you normally eat curries with plenty of meat, why don’t you give a different type of curry a chance? 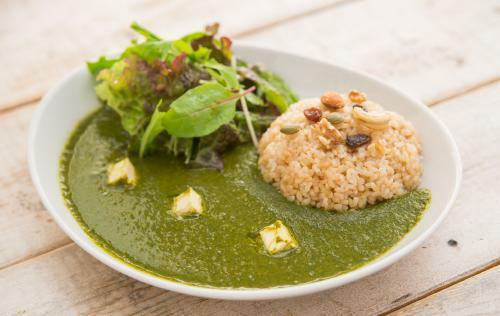 Here are 7 carefully selected vegan curries from excellent restaurants in Tokyo which have been Vegewel certified in terms of taste and volume! 2 Special and fine Indian curry! “Sasaya Café” in Oshiage. 3 After trial and error with our recipes, we came up with this special curry! “T’s Restaurant” in Jiyugaoka. The “Ain Soph.”, a very famous vegan restaurant chain, which has four stores in Tokyo. It adapts to trends well and each store has a different character. The vegan curry which has been picked for this report is from the Shinjuku Sanchoume restaurant. This restaurant has an “exotic” character and it serves dishes with plenty of spices and herbs. The “green curry (1,400 yen exc. tax)” has a sweet and mild taste and is easy for women and children to eat as well. It has a mild and rich flavor and some customers have asked “if there is added butter inside the curry?”. Their “dried curry with plenty of nuts (1,300 yen exc. tax)” has a moderate spiciness and the crunchy nuts add extra flavor to the curry. This curry is one of their best selling meals since the restaurant opened and many male customers choose this as well. Click here for location and detailed information on Ain Soph. Journey. Please see more information about Ain Soph. here. Special and fine Indian curry! “Sasaya Café” in Oshiage. 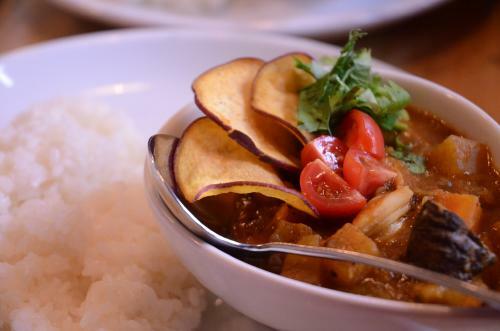 One of the signature dishes for Sasaya Café in Oshiage is a vegan Indian curry. The “Indian mini set meal (1,242 yen ~ inc. tax)” is highly recommended as it serves a different variety of Indian curries within the meal. Inside the restaurant has an open atmosphere and customers can relax and take their time to enjoy the meal! Click here for location and detailed information on Sasaya Café. Please see more information about Sasaya Café here. After trial and error with our recipes, we came up with this special curry! “T’s Restaurant” in Jiyugaoka. It took a lot of effort until it reached a perfect flavor. Their best “T’s veggie curry” is 1,500 yen inc. tax during the weekend lunch time, 1,350 yen inc. tax during weekday lunch time, and 1,350 yen inc tax at dinner time. The vegan curry is quite spicy and also at the same time rich in flavor with a distinct taste of vegetables. Other curry dishes are available as well for example “Matsaman Curry” is 1,500 yen inc. tax during weekend lunch time, 1,350 yen inc. tax during weekday lunch time, and 1,350 yen inc. tax. at dinner time. Click here for location and detailed information on T’s Restaurant. Please see more information about T’s Restaurant here. “I love meat but if I eat too much I have heartburn…” “I don’t like the fat content of meat.” If you agree with these comments, please try this curry with soya meat! 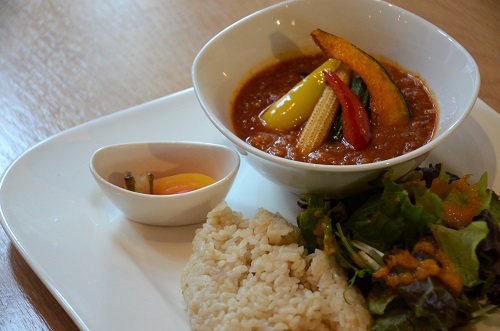 The Dance cube café in Kachidoki offers a vegan curry “An all vegetable curry with fully ripened tomatoes (1,200 yen exc. tax)” which replaces meat with soya meat substitute. It has a similar chunky texture to meat, but tastes much lighter than meat. Their original spice flavor of this curry will make you kind of addicted! Click here for location and detailed information on Dance cube cafe. The popular bakery store “Café Mugiwarai” has many visitors from afar. Inside the store, visitors can enjoy tasting the vegan curry which goes well with their homemade bread. The above image is “Tomato and millet curry plate (1,200 yen inc. tax)”. 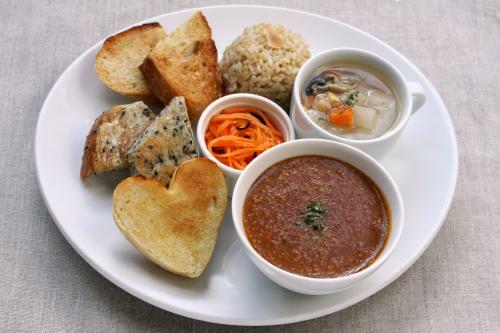 The curry is accompanied with three slices of toast from different types of bread, a brown rice, and a specialty “layered vegetable soup” which are made only from vegetables and salt. Other dishes such as “chick peas curry plate” and “millet and coconuts curry plate” are available as well. *Butter may be spread on some toast, but non-butter or Incainchi-oil options are also available when you order. Click here for location and detailed information on Café Mugiwarai. Please see more information about Café Mugiwarai here. This vegan café has lots of greens and flowers decorated throughout and provide a very healing atmosphere. 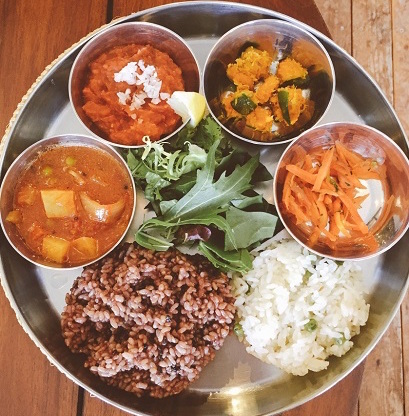 “Today’s curry plate (1,200 yen inc. tax)” is a vegan curry specially prepared on the day by the owner Yumiko-san. This curry is gluten free. The vegetables used for the dishes at the café are all organically sourced. You can taste the goodness of the vegetables and spices with just the right balance in this curry. Click here for location and detailed information on Komazawa Vegebon. Please see more information about Komazawa Vegebon here. This very popular restaurant in Kanda actually has a special menu for a vegan diet! The “Spice Box” restaurant is about 5-minutes walk from Kanda station. 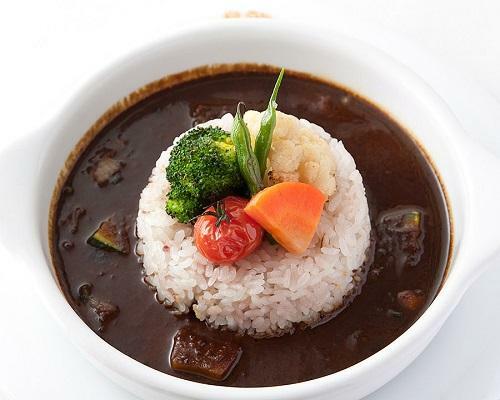 The restaurant uses curry roux which is made purely from vegetables, and is highly popular among vegan and vegetarian customers. Their vegan friendly dish is a “Vegetable and Dal curry (980 yen inc. tax)”. It has a generous volume and is very popular with many male customers. As well as this, the store has 5 different varieties of curry dishes including chicken curry. No matter if you are a vegetarian or non-vegetarian, this restaurant accommodates tastes for everyone to enjoy. Click here for location and detailed information on Spice box. Please see more information about Spice box here. We hope you enjoyed our special report on these mouth watering vegan curries. In fact, many vegetarian, vegan or macrobiotic restaurants serve curries. 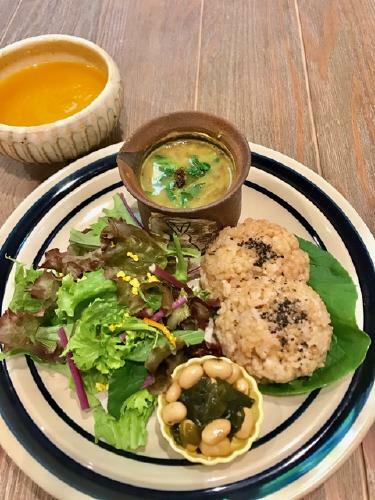 This report only introduces some of them, but we are sure there are many more delicious vegan curries available across Japan which we don’t know about yet. 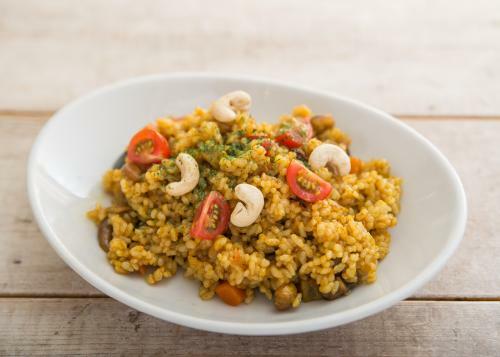 Vegewel will continue to report about these restaurants with their delicious meals, and we will regularly make a special report on delicious vegan curries. No matter if you are vegan or not, if you love curry please do watch out for our special report!